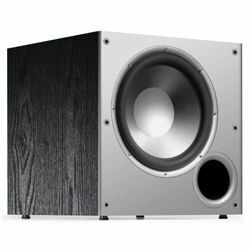 Definitive Technology ProSub 800: Why are my feet buzzing? Definitive Technology ProSub 800 would be a fantastic sub for a smaller room, call it up to maybe 16' x 16' with a standard 8' ceiling. No complaints at all about the sound quality or output. And for the price it costs (low $200 range) it really is a steal. This sub is overkill by a long shot for a small room. Good to know that you can find more information in our Definitive Technology ProSub 800 review. It's stunning that such deep bass comes from such a tiny sub. Even after seeing the dimensions in the product description, it can still be just a little surprise thanks to its size. It's considerably smaller than it's predecessor which were not exactly a big sub either. It has a Low-Frequency Effect (LFE) in as well as line-level inputs in case your receiver does not have an LFE out. There is a power on and off switch on the back and the power cord detaches from the unit making storage and transport easier. Included is a variable crossover selector on the back as well. On the side is a rotary volume knob (placement may be a problem if you place your sub in a tight corner or location). 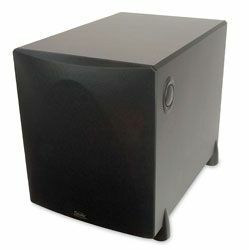 The design of this subwoofer is great, nothing fancy that draws attention in your home decor. It is an acoustic suspension system with a passive radiator which works in tandem with the woofer. 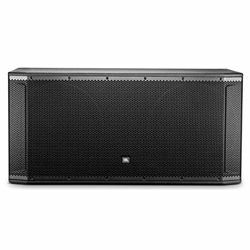 For the price, this is an excellent sub for smaller rooms or basements/TV rooms. You can crank a lot of loud/rock music from your home audio setup... and the whole house sounds good, even upstairs. It fills in the bottom and is well balanced. Makes everything we play or watch sound better. If you want more boom and shake, get the ProSub1000. ProSub 800 specs are incredible for the price and it will rattle your teeth. The 800 is probably a good choice for condo/apartments too. Will not bother your neighbors, but sounds awesome. You can find attractive the fact that the speaker control is on the right side of the cabinet and has an indent in the dial. You can tell what the volume setting is just by feeling it with your fingers--a real plus if your sub is in a cabinet up against the right wall. I find ProSub 800 setup the volume about halfway provides more than enough bass for anything I play. At mid volumes, the ProSub 800 snaps alive and adds a nice warm layer to the media. Mid-volume presence and clarity is clearly this sub's wheelhouse. At higher volumes, though, it became clear that this sub was anemic for a room. The bass is particularly heavy. On the sound front, this thing does very well. The bass just seems more detailed and precise. The ProSub is front firing with a bottom firing passive radiator, so we were caught by surprise at how much more you can feel this bass shaking the floor. The only area that the ProSub falls a little is in the volume dept. It may loosen up in time, and room placement can make a big difference. The volume it up at around 2/3-3/4 to fit with the sound from the sound system. The crossover control does work with any and all inputs. Some tricks for Definitive Technology ProSub 800 settings: use the RCA subwoofer output from the inclines to the RCA subwoofer input in the sub, with the crossover frequency set between 85 and 100 Hz (per a suggestion from Definitive Technology customer support). Highly recommended combination if you are able to use the Inclines. The instructions are simple to read and informative enough to feel like you just plugged it in and got it going right out of the box. This sub will definitely shake you home. 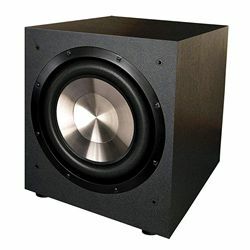 This is a great deal for a subwoofer, especially one from a high-end speaker manufacturer. They check everything before it leaves them to get to you so you should receive a perfectly made subwoofer. The construction is solid and there is nothing on it that feels cheap. Love this subwoofer Nothing else comes close in power, frequency response, quality or size (smallish) for the money, period. Rated down to 20 Hz, it's a small box with an 8-inch driver (and radiator), but it's getting pretty low. Sealed box, so the bass is very tight and packs a good punch, not boomy at all. Tight, precise, and will provide that sonic vibration associated with theater experience.